During these days following Hurricane Irma and leading up to the High Holidays, life can take on new meaning. 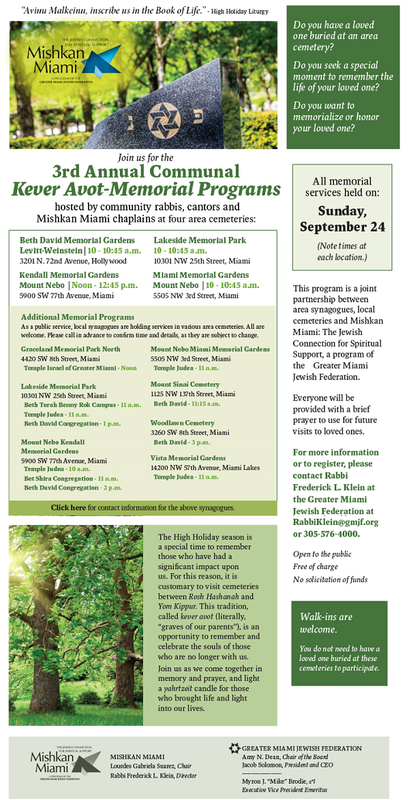 Mishkan Miami: The Jewish Connection for Spiritual Support, together with local synagogues and cemeteries, has organized Kever Avot memorial services to take place on Sunday, September 24 at locations across the community. Click here to read a special message from Mishkan Miami Director Rabbi Frederick L. Klein and to learn about times and locations for the memorial services.